Low Carb Broccoli Cheese Soup— Even better than Panera! …because let’s face it, there’s just something about a broth made of cheese that can put a smile on anyone’s face! This low carb broccoli cheese soup recipe is just that! 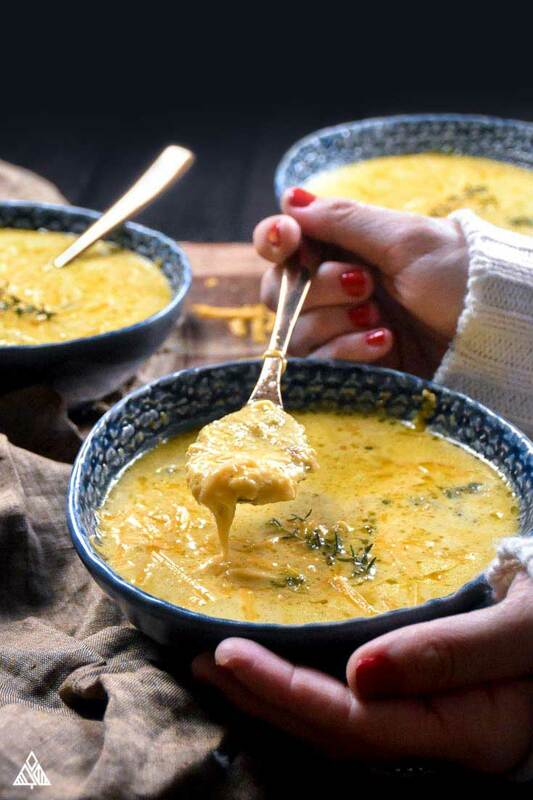 A cheesy, saucy, thick, soup lover’s dream. 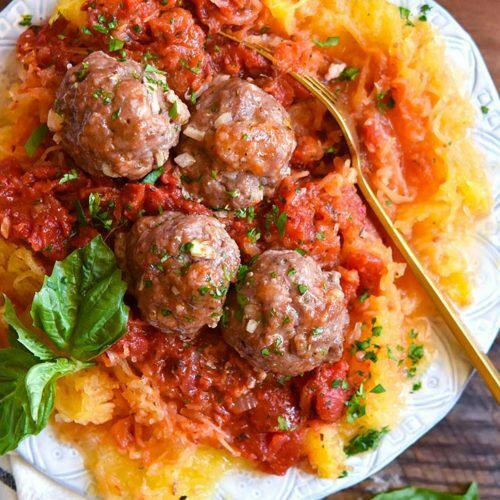 It’s so decadent and delicious, you won’t even know it’s a low carb dinner! And as far as I’m concerned, that should be the goal of all low carb recipes! So let’s get making this low carb broccoli cheese soup recipe! The best broccoli cheese soup Recipe! 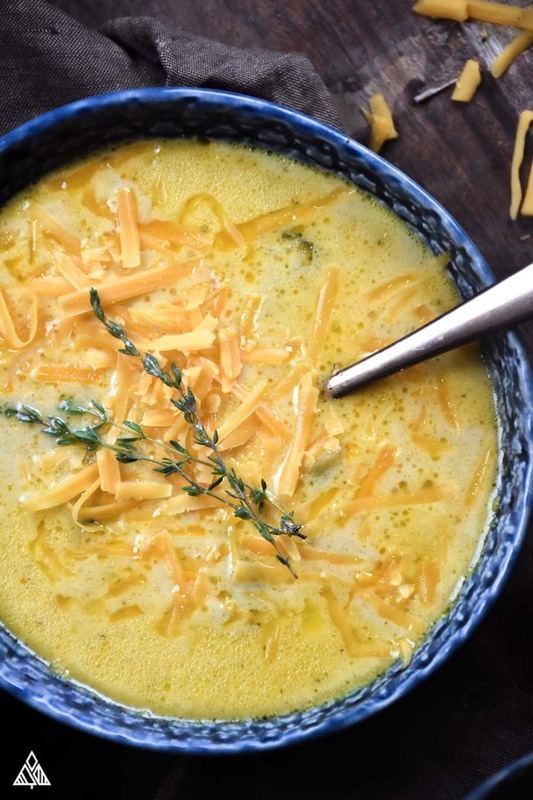 There are few soup recipes more nostalgically delicious than easy broccoli cheddar soup — we all grew up eating Mom’s velveeta broccoli cheese soup recipe! 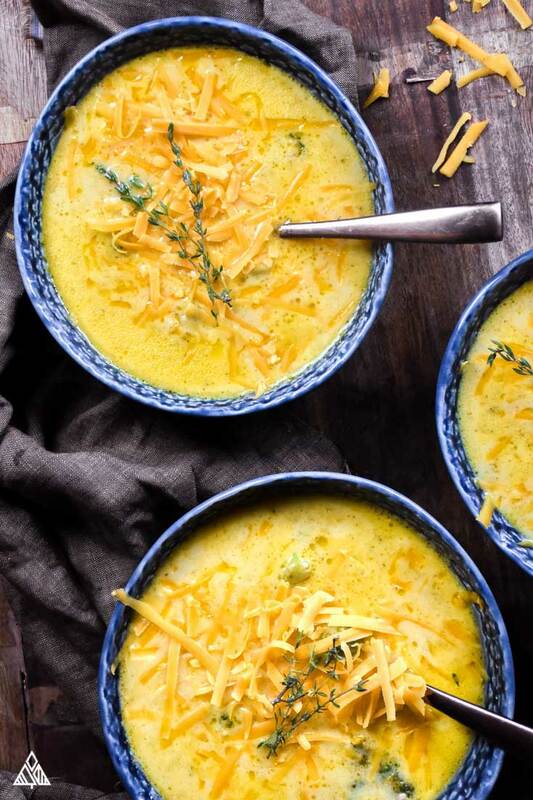 The problem for us following a low carb meal plan is that traditional broccoli cheese soup recipes use a myriad of ingredients we try to avoid! Another shocking ingredient. Believe it or not, there are a TON of carbs in cow’s milk. Good news for us, there’s a myriad of low carb milk options we can choose instead. In this recipes I swapped milk for heavy cream. As well as being low in carbs, it adds a delicious creaminess to be enjoyed by all! I’ve also tried this healthy low carb cream of broccoli soup with homemade almond milk. TBH, didn’t like it as much — as you’d imagine it didn’t have the same thick nor creamy consistency. This one’s a bummer, I want to share with you upfront. You know how broccoli cheese soup is crazy thick? Which we all know, love, and probably expect when we’re trying a low carb broccoli cheese soup recipe? This thickness stems from the addition of flour or cornstarch by the cup full. That just simply wont work for us low carbers. So here, you have options…. Many people feel that the cheese alone leads to a thick enough soup. However, my family, and myself, prefer this keto friendly broccoli and cheese soup to be as thick as possible. Which I achieve by adding 1 Tablespoon of cornstarch or arrowroot powder. This helps to thicken the soup, just a little, without a huge sacrifice in nutrition. …In fact, both have 7 grams of carbs per tablespoon. Use it if you think it’s worth it! If you aren’t sure, try making the soup without it first. Taste it, see if it’s thick enough for you. If not, add it in. Make sure you stir and allow the ingredient to cook for a few minutes before taking it off the heat. Ok, obviously, this low carb broccoli cheese soup won’t be served in a bread bowl. But I do have a few suggestions that’ll taste just as good, and won’t ruin your eating plan! I love topping it with some delicious low carb chips, veggie chips or low carb crackers (made with an almond flour base). 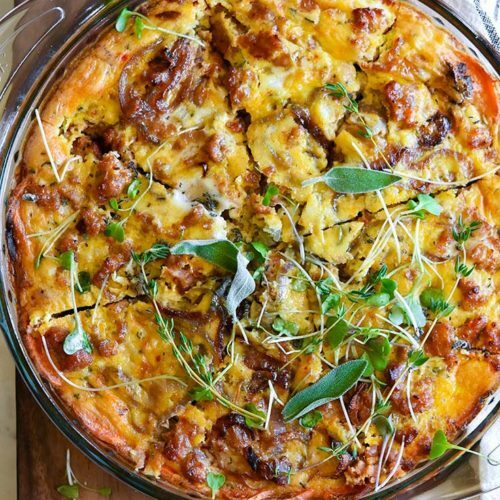 For this recipe I prefer the crackers over my low carb tortilla chips, which are made from a cheese — don’t want to go cheese overboard! I reserve these for my low carb taco soup recipe! If you’re one of those who can’t get enough cheese, try topping your bowl with some parmesan crisps for a cheesy crunch. Yum! …Or cube slices of low carb bread, pop them under the broiler for a few minutes (keeping a close eye so they don’t burn) and sprinkle these low carb croutons on top of your soup! Cooking Low Carb Broccoli Cheese Soup : Tips For Perfection! It’s a perfect kitchen tool for soup making because it’s so much easier than trying to pour hot soup into a regular blender (literal hot mess). Using a spoon, I fish out a few of the smaller broccoli pieces and place them in a bowl, use the immersion blender until everything is nice and smooth, then I add the broccoli back! I’ve had a few people ask, so thought I’d touch on cooking your keto broccoli cheese soup slow cooker style! I don’t yet own a slower cooker — I know, YIKES — So, haven’t tried it! TBH, I don’t know that it’s entirely necessary, as it comes together REALLY fast. Most of the time spend making this recipe will be when cooking the broccoli! Use your broth of choice. Using veggie broth turns this soup into one of my favorite low carb vegetarian recipes. I use chicken broth, honestly because I buy chicken broth in bulk at Costco. Chicken Broth has about 1g of carbs per cup, while veggie broth has about 2g. Nothing! I know it’s a bummer, but you’ve gotta use a shredded cheese for this recipe. Whether you buy it pre-shredded or shred it yourself, it helps to melt the cheese quickly and blend with the rest of the ingredients! 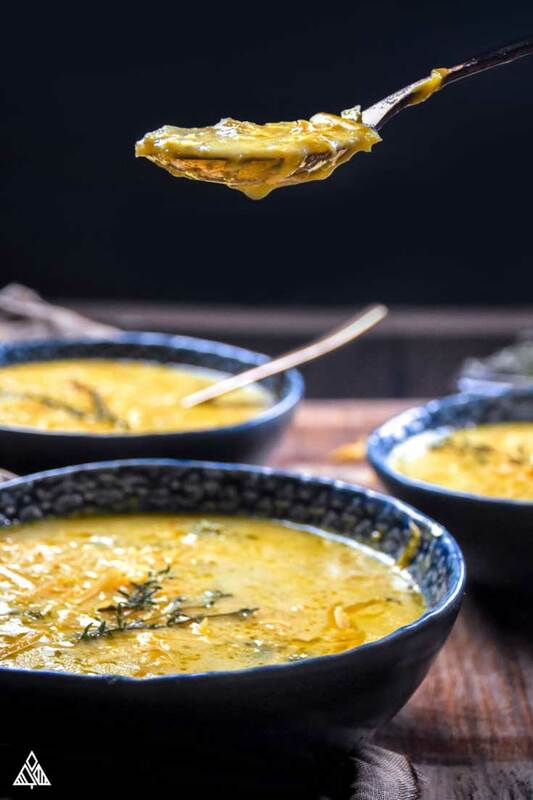 I use cheddar not only because it’s the traditional choice for this soup, but because cheddar melts so beautifully. My household doesn’t consider a meal a meal unless there’s some sort of animal protein (other than eggs of cheese — weird I know) in the meal. So, to make this a tad heartier, I diced cooked ham and added it to the dish! I’ve also added shredded rotisserie chicken — yum. What would you add? As soon as the cheese has melted, remove the soup from the heat. I’ve learned the lesson the hard way — the cheddar will literally burn on the bottom of the pan and create a huge mess you wont want to deal with! 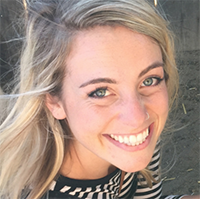 In the end, we all want to feel cozy and warm during the winter months — while sticking to our eating plans! And as difficult as this can be at times, low carb recipes like this low carb broccoli cheese soup make it easy and extra delicious! 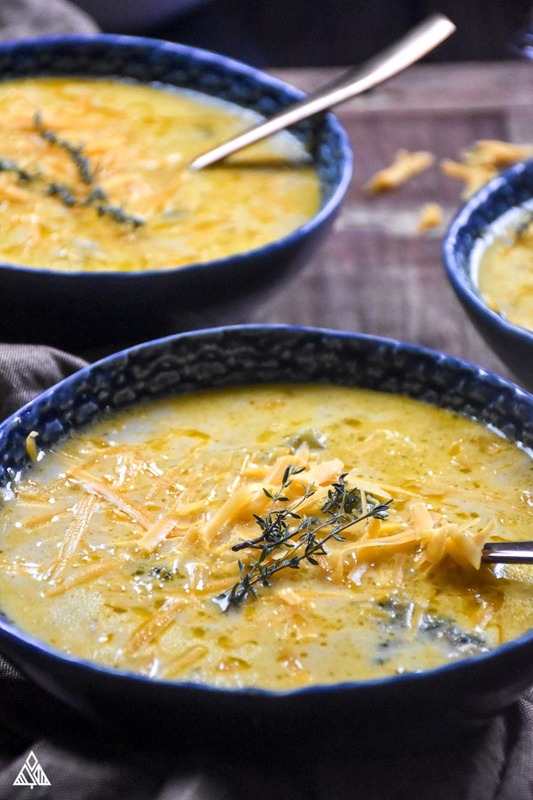 Comfort in a bowl, this low carb broccoli cheese soup will warm you from the inside out! Using a large pot melt the butter. Add the onions and sauté until they're translucent. Add the garlic and stir for one minute, making sure not to burn. Add the chicken broth, heavy cream, and chopped broccoli and stir to combine everything. Increase the heat to bring soup to a boil. Once boiling, reduce heat, cover with a lid and the soup to simmer for 10-20 minutes. You’ll know it’s done cooking once the broccoli is tender. Keep the pot at a gentle simmer, and add the shredded cheddar cheese -- one handful at a time, making sure the cheese incorporates/melts before adding more. Stir constantly, and continue until all the cheese has melted and combined, then remove from heat (very important!). Using an immersion blender, blend all the soup until the broccoli is a size you’d enjoy. I usually take a few small pieces of broccoli out and add them back in after blending. Pour soup into bowls and enjoy! I love making a huge batch of soup by doubling the recipe. 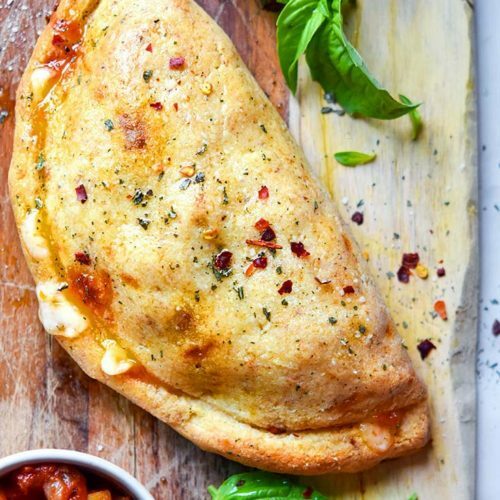 Eat it that night, enjoy throughout the week and freeze the rest in individual baggies to defrost whenever dinner isn’t planned. 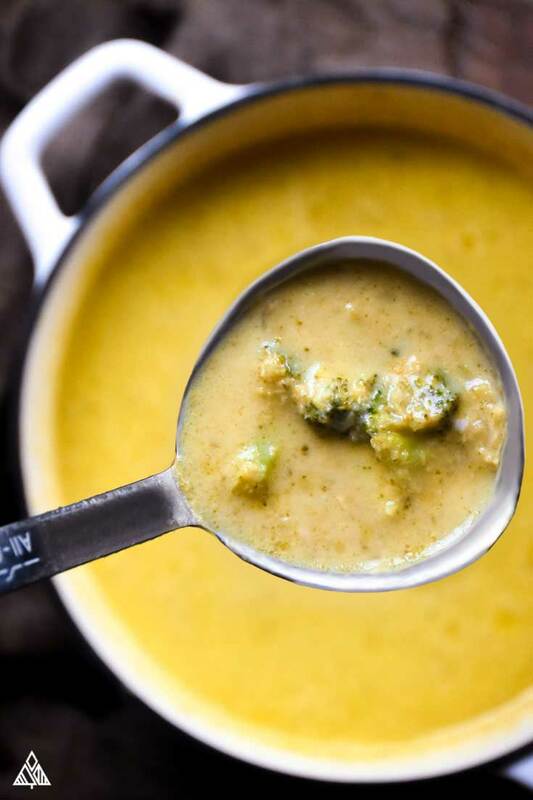 My freezer is currently full of everything from this keto friendly low carb broccoli cheese soup recipe, to low carb beef stew — then I get to eat what I’m craving, without having to make it! 2. Low carb soups are a cost efficient way to stay on track. When you compare your low carb food list to those of traditional grocery shoppers, you’ll probably find yourself spending a good amount more money on food. Enter the low carb soup — typically makes enough to feed the crew for a few meals! It’s simple to reheat in a microwave or on the stove. 3. Soup is a great way to help sneak in some extra veggies! 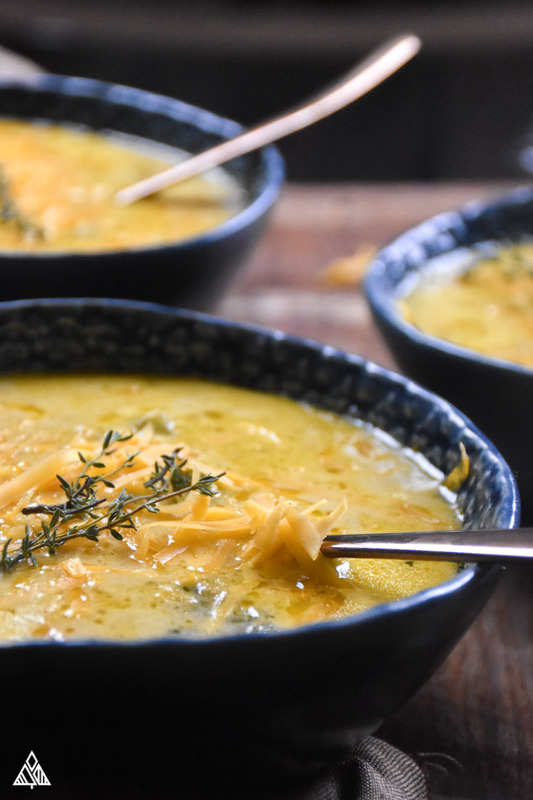 This soup is great to get non-broccoli lovers eating their greens — you can also try low carb tomato soup and low carb cabbage soup for other veggie based alternatives! 4. So easy to make, you’ll still have enough time to binge watch your favorite Netflix shows! If you are making our recipe on the stove top, the hardest thing you’ll have to do is stir the cheese to ensure it doesn’t burn. Literally, the bulk of your time will be spent taking care of other things while the soup simmers on the stove. What more could you ask for?! If you are feeling extra lazy, busy, or a combination of the two… make this low carb broccoli cheddar soup slow cooker style! Hi Rosemary! We just added a nutrition label to the recipe. Hope you enjoy! I LIVE ON THIS SOUP. I tweaked it some: upped the broth (chicken) and heavy cream by 1/2 cup; used brie, goat cheese and cheddar. Added cauliflower, since it works as a thickener, too. Spiced it up with a bit of dijon mustard, some curry and – believe it or Not- some Montreal steak seasoning. I used freshly ground tri color pepper for a little ‘brightness. This time, I’ll add chicken riot extra protein.